Many different sectors of the working class in France began massive strikes this morning, after railroad workers stopped work last night. Rail workers opposed to French President Emmanuel Macron’s proposal to privatize the state-owned rail company SNCF are leading what has been called the biggest test of strength to date between Macron and the French working class. The SNCF expects the strike call to be followed widely. It anticipates that only one in eight high-speed TGV trains will run across France and only one in five regional trains. Initial reports indicate that eight in ten conductors are following the strike. Up to a third of flights will be cancelled today and electricity maintenance and garbage pickup will be limited as sanitation workers, electricians and gas workers halt work. Le Parisien is concerned that the strike “will be very widely followed.” There are increasing concerns within the trade unions and the bourgeois parties that the strike movement will link up with on-going strikes of postal workers in Hauts-de-Seine, the Gironde and Rennes. Workers at the retailer Carrefour also struck last weekend against job cuts. Four trade unions—the General Confederation of Labour (CGT), the National Union of Autonomous Unions (Unsa), the French Democratic Confederation of Labour (CFDT) and the Solidaires Unitaires Démocratiques (SUD)—have called for job actions against privatization proposals. 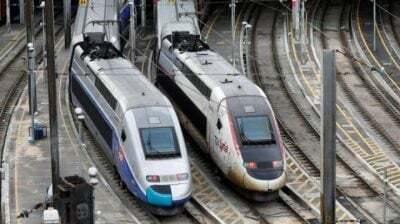 Under immense pressure from their members, the unions, though refusing to call an outright indefinite strike, will alternate between two days of strike action and three days of work at SNCF until 28 June. The trade unions are portraying this as an attrition tactic and a means to protect strikers, who in France receive no strike pay. Macron’s “reform” and “modernisation” plans mean the elimination of social programs and rights won by the French working class over decades of bitter struggle. Last year, the Macron government passed a labour market reform that paves the way for mass layoffs and expands precarious working conditions. Macron and the other bourgeois parties demobilised and suppressed the mass opposition to this law with the assistance of the trade unions and attacks by the police. Macron’s latest privatization efforts are the most ruthless yet. The key project is the restructuring of SNCF. The French ruling class seeks to eliminate the “employee statute” that provides workers with layoff protection and the option of early retirement—a high water mark of the class struggle in Europe in the course of the 20th century. The government wants to divide the state railway company into three shareholder companies—network, rail operations and railway stations—and open it up to international competition. SNCF’s expenditure is to be cut by 27 percent on the backs of the employees, and its debt of €50 billion ($61 billion) reduced. The strike recalls the events of 1995, when railway workers shut down the country for three weeks and compelled conservative Prime Minister Alain Juppe to withdraw a proposed pension reform. This time around, salaried employees are involved in the strike alongside the workers. Simultaneously with his attack on railway workers, Macron is planning to substantially cut public-sector jobs and reform unemployment insurance, forcing jobless workers to accept new employment under the threat of severe financial penalties. The government also proposes an education and training reform that will make university education more expensive and more difficult to obtain. On 22 March, several hundred thousand people took to the streets to protest Macron’s plans. Strike action is also taking place at the airline Air France for a 6 percent pay increase. After a one-day strike on Good Friday, the trade unions called for further strikes today and on April 7, 10 and 11. Air France expects that a third of long- and mid-distance flights will be cancelled today, as well as 15 percent of short-distance flights. Since the rail system will also largely grind to a halt, chaos and traffic jams are expected on the roads. Macron, his government, and his party La Republique en Marche (LRM) have thus far shown their determination to resist the strike movement. On 14 March, the government adopted an enabling law that permits it to implement the reform of the SNCF swiftly and, if necessary, by decree. It will first be passed in parliament, where the government party enjoys a majority. The government is relying above all on the trade unions to carry through its attacks. The unions have no interest in causing trouble for President Macron, whom they supported in last year’s election. They assisted in the passage of the labour market reform and have decades of experience in dividing and demobilising militant working-class struggles. It is also by no means certain that the trade unions will succeed in holding the workers’ anger in check. The strike movement in France is part of an international offensive by the working class—teachers in the United States, lecturers at universities in Britain, Sri Lanka, Algeria, Tunisia and Kenya, industrial and public-sector workers in Germany, Amazon workers in Spain, and other sections of workers internationally. This is a death sentence for the growing strike movement by workers. The demands of workers everywhere will be met only when they overcome the restrictive nationalist perspective of the trade unions and bourgeois parties and construct rank-and-file committees to link their struggles in an international movement for socialism.